Becoming a cloud reseller enables you to earn recurring revenue by offering cloud computing services to each of your clients without the added cost developing your own infrastructure. The AwesomeCloud partner program is designed for IT service providers that want expand their product line by reselling white label cloud services. With no monthly fees, minimum spending thresholds, or hidden charges, you can focus your resources on business development and grow your business. Cloud computing’s rapid growth is an opportunity for your business to generate new recurring revenue. As part of the AwesomeCloud channel partner program, you can offer white label cloud services to each of your clients without the cost of developing your own infrastructure. 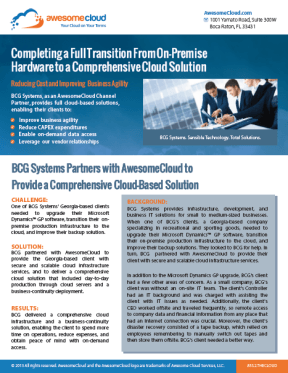 As an AwesomeCloud partner, you’ll have the opportunity to capitalize on the widespread migration from on-premise IT solutions to hosted cloud solutions. Channel partners can offer white label cloud infrastructure, online backup, business continuity, and software licensing. The AwesomeCloud channel partner program enables you to maintain direct relationships with each of your clients by offering the AwesomeCloud platform as a white label product. As a partner, you will always be the first line of contact. As a member of AwesomeCloud’s channel partner program, you’ll be offering your clients the peace of mind that comes with a 100% uptime SLA, enterprise-grade security, and hosting at the NAP of the Americas data center. Becoming a channel partner is a great opportunity to grow your business by reseller secure, Microsoft-driven cloud solutions. To learn more please get in touch via phone (855.2.THECLOUD), email, or by filing out our brief online form.